BlackBerry CEO John Chen says the quarter makes him "feel good" about BlackBerry's outlook for fiscal 2019, which began March 1. TORONTO — BlackBerry Ltd. reported a first-quarter net loss of $60 million, despite gains in the automotive software division and reporting what the company considers a solid start to its 2019 financial year. Revenue was $213 million for the quarter ended May 31, according to Thomson Reuters Eikon. But BlackBerry said this year's first-quarter net loss included $28 million related to an adjustment of the fair value of some of its debt and $22 million related to amortization of acquired intangibles. There was also $18 million in stock compensation expense and $4 million in restructuring charges. Revenue from software and services was $189 million, up 18 per cent year-over-year, although growth was unevenly distributed between BlackBerry's three main business units. BlackBerry's enterprise software and services business had $79 million of revenue, down 14 per cent from last year, while revenue from licensing intellectual property was up 96 per cent to $63 million. BlackBerry Technology Solutions, which primarily consists of the QNX business, was up 31 per cent at $47 million. 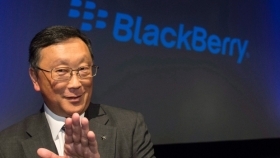 BlackBerry chief executive John Chen said the quarter makes him "feel good" about BlackBerry's outlook for fiscal 2019, which began March 1, but said he doesn't want to be overly optimistic about its growth trajectory — which he said would be gradual, not sudden. "Sometimes, [if] you get overly bullish, you jinx yourself," Chen said in an interview. Chen said that BlackBerry expects QNX's automotive products, which include older infotainment software and newer technology for autonomous vehicles, will ramp up gradually rather than repeat the 31 per cent year-over-year growth rate in this year's first quarter. "Honestly speaking, that number was a little higher than I expected," Chen said after his quarterly call with analysts. "In this year's growth number, we start seeing some of the new stuff in addition to infotainment systems. That's encouraging." He said there's a danger that a long-term disruption in global trade could affect BlackBerry but so far there's been no evidence it has been affected by the Trump administration's hard stance against other countries and regions.